TMV is a truly ground-breaking project, that cleverly used social media with a lively blog to tell the story of its conception and creation over several years, long before the first grapes were harvested. This built interest amongst wine lovers early on, and thankfully, the wines turned out to be every bit as special as this terroir, literally on the Tulbagh mountainside, far to the north of Stellenbosch. The farm is privately owned by Englishmen Jason Scott and George Austin, and extends to 180 hectares, but only 16 of those are planted to vine. Sharing the land are 150 head of sheep, which are mainly used to provide manure and to keep the cover crops in trim on this certified organic vineyard. There’s a holistic, ecological ethos that permeates this remote place – raptors are encouraged to nest in order to scare off grape-nibbling birds, though as we stood on the winery terrace we watched a troop of baboons happily picking their way through the last of the Mourvèdre high on the mountain. 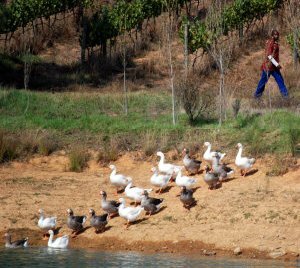 “I guess they are entitled to it,” said viticulturist Paul Nichols, “It was their home long before it was ours.” Though far rarer visitors, cheetahs have also been spotted using the reservoir come duck pond at the heart of the vineyard. TMV is an extraordinary and remote place, needing a four-wheel drive to reach it along miles of bumpy track, and scorching hot on my March visit when the thermometer read well over 40 in the shade. Planted with both irrigated and unirrigated bush vines, and with fermentation using only wild yeasts found in the vineyard, there’s a literally hands on approach to the winemaking in small tubs and vats. Another winemaking couple has taken over from Chris and Andrea Mullineux here, as Paul Nichols works in partnership with his wife Rebecca Tanner. 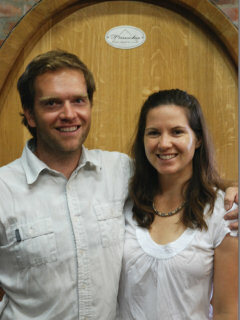 As with the Mullineux’s there’s a blurring of the roles they share in vineyards and cellar. 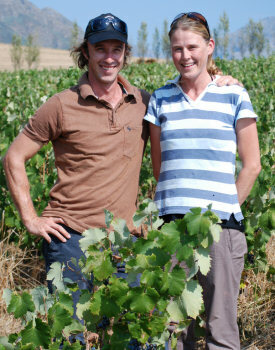 Many biodynamic practices are employed in the vineyards, the owner’s original vision being carried through by Paul and Rebecca – who met in Australia whilst Rebecca was making wine with ultra-organic devotee, Vanya Cullen of Cullen Wines. The couple’s involvement with TMV is total: they also tend the sheep and all of the 180 hectares. It seems the new team at the helm here are a very safe pair – or two pairs – of hands. Very sweet, ripe, rich fruit. Lots of chocolate and plummy blue-black richness. Big and plush, a very ripe and chocolaty style, the tannins grippy and giving this a liquorice edge, playing against that super sweet fruit. 92/100. £14, Waitrose. This superb wine comes from a six-year-old solera started by Chris Mullineux when he was winemaker here. It is a Chenin Blanc Vin de Paille (straw wine) with beautiful aromatics: lots of cherry and super fruit sweetness, a strawberry syrup palate with delicious toasty richness and boldness, holding terrific acidity. 93/100. Born and raised in Johannesburg, Chris Mullineux says he “got a big break,” when Swartland pioneer Eben Sadie put him in touch with the newly established Tullbagh Mountain Vineyards when Chris was still finishing his final year of study to become a winemaker. The gamble paid off handsomely, as Chris quickly established a reputation, putting Tullbagh on the map with their Syrah in particular. With the help of backers, Chris and his Californian wife Andrea, who shares winemaking duties, struck out on their own in 2007. They have just three wines, a Chenin-based white made from 40-year-old vines plus little bits of various Mediterranean varieties including Viognier, Grenache and Clairette. Their red is a Syrah, the fruit coming from a mixture of vineyards, with very different soils that give different textures and aromas. On the Riebeek Mountain, shale and slate dominates, (so even white varieties are quite phenolic, according to Chris). On the Paarl side of the valley, granitic soils give more mineral and aromatic wines. The third wine echoes another of the success stories from their time at Tullbagh Mountain, with dessert wine. In this case it is a straw wine made mostly from Chenin Blanc, and which sold out almost immediately on release. Though all vineyard and winery duties are shared, Chris says he is happiest out in the vineyard where all picking decisions are done entirely on the flavours in the fruit, and not on analysis of sugar and acid numbers. Andrea meanwhile is particularly pleased by their new cellar in the town of Riebeek-Castel, a lovely, simple and functional space with stainless steel and large wooden foudres, as well as smaller barriques amongst the equipment. Only French oak, all barrel-fermented in old wood – fourth and fifth wine – only natural winemaking with no added yeasts, enzymes or tannins. Minimal herbicides or pesticides, and all farming naturally: a bit of a theme in the region with Lammershoek and Scali in organic conversion. Nutty nose, very clean, with notes of seeds and nuts and a clean apple fruitiness. The palate has a phenolic richness and grip, with fabulous weight and sense of balance and precision. Pithy, lemon and orange acidity and a great sense of minerality running through. 91/100 £12.95. Similar, tight, nutty nose, but more appley with some fresh green apple and a Cox’s Pippin nuttiness. The palate has fine poise and elegance, and real freshness. There’s a lovely clarity and freshness in the finish, with delightful definition. 91/100. Dried over a period of three weeks, whilst sugar and acidity both rise. Lovely complex tea and orange nose, with lots of tobacco and nuttiness. Fine, sweet palate, with terrific purity that shimmers with lemon and honey and a real barley sugar richness. 93/100. 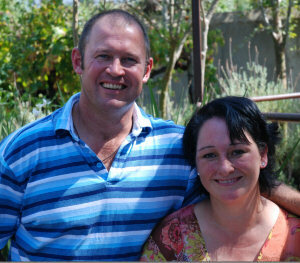 I was delighted that Willie and Tania de Waal met for lunch with myself and Chris Mullineux to present their wines. The de Waal’s are a no-nonsense couple who in 1999 added a wine operation to their family, which was founded by Willie’s great-grandfather in 1877 on the proceeds of a huge 44 carat diamond he had uncovered. Willie and Tanya had grown grapes for years, and indeed made a little wine for home consumption and the enjoyment of friends, but their success, particularly with Pinotage, led then to pursue a quality dream. Today production is still only around 1,000 cases, and three wines are produced: a white blend, a Pinotage, and accounting for the bulk of production, a Syrah with fermentation in large oak vats, and ageing in French barriques. Farming is sustainable. A commitment in London meant that neither Eben Sadie nor Adi Badenhorst where in the area at the time of my visit, so with huge generosity Chris Mullineux gathered up wines from them and the region’s other estates for a tasting in his cellars. Same winemaking as the Pinotage, though aged in oak for a little longer. From a decomposed granite soil. Lovely lifted, clear, almost floral perfume here. The ripe black fruit comes through, with a certain chocolaty smoothness. 91/100. Chenin dominates with lots of Mediterranean varieties in small quantities. Very aromatic, with lightly oxidised, Rhôney entry, with lots of richness and honey. Snaps together on the palate, with delicious tang and vibrancy – big orangey blast with citrus and mineral acidity coming through. 92/100. With Richards Walford in the UK, around £14. See all stockists on wine-searcher. Italian tinned tomato quality, a touch baked perhaps. Good fruit and balance, but that slightly stewed quality detracts. Shiraz, Mourvèdre, Cinsault. Big, open, smoky and schisty nose with a dry extract quality that is a touch ashy. The palate has fine, juicy fruit, but then it seems a touch extracted – a touch – ashy. Still a really nice wine with great black fruit. I would have liked it a tiny bit less extracted. 90/100. Around 85% Syrah, 15% Mourvèdre. Beautifully fleshy and dense, with loads of chocolate and meaty quality. Great density and natural extraction here, soaks up the 100% new wood. Very impressive palate, with a juicy sweetness to the fruit, but savoury, dense and beautifully structured. Big, but really beautiful. 95/100. See all stockists on wine-searcher.